If anyone is looking for a good mask, I bought this one online. It's better than getting the disposable ones since these can be used for 3-6 months depending on how often you use it. I can attest for the quality. When I don't wear my mask, I get sick within a few hours of exposure to the air. Hope this will be helpful for someone! 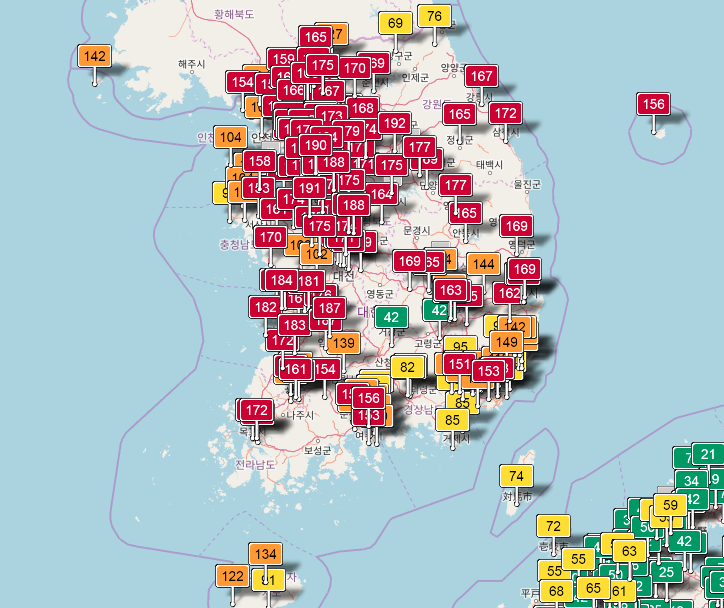 Just because air pollution is worse somewhere else doesn't make the air in SK any cleaner. "It isn't that bad." Damning with faint praise? What my body often tells me during and after exercising is that it's bad. Lots of coughing to try and get rid of the dust. Today is mostly orange with some red. Mostly in the orange. Well, in Seoul at least. Go down to the second chart. The enviromental performance index has Korea at 173 out of 180. Haha, I just ordered a Cambridge Mask as well. Was deciding between that and Airinum. If you're concerned about the pollution, you can check out a friends site here in Taiwan. Our air has been quite bad recently and he has been very active in doing something about. In addition to organizing some events to help bring awareness to the issue, he has been working with the government and has set up a website that sells masks, purifiers, filters, and the laser egg pollution meter. Many expats have purchased the laser egg from him and have used it in their classrooms to educate the schools, students and parents. When parents see the daily reading, many have pushed the schools to provide air purifiers for the classrooms. And as many parents are wealthy with government connections, their voices and concerns have been instrumental in bringing awareness to the problem. 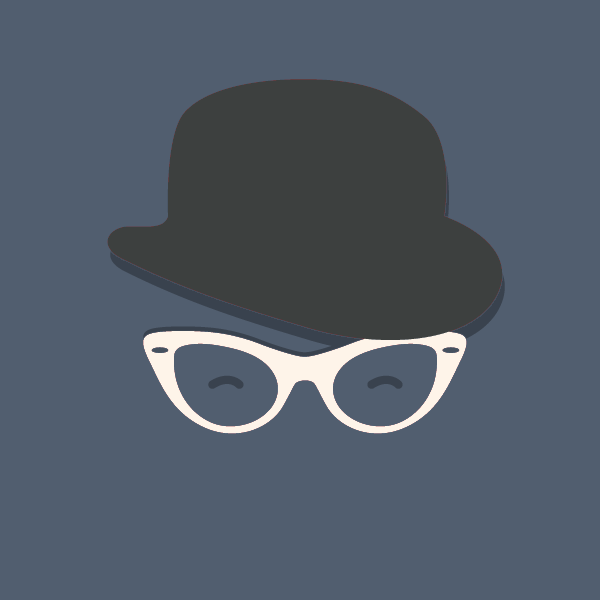 His name is Shaun and is an expat from the UK. Lots of red days recently with 2.5 over 150. A few purple areas in Busan and Seoul today. I felt like things got a bit better this last summer when Moon shut down the coal reactors for a few months, but they're back on and this last fall and current winter have been filthy. A coal reactor? Wow, is this new tech or some kind of steam punk? "Ah, really, it is very sparkling and delicious." Do you work for the government or something? Everytime this topic comes up you jump in the thread going "China's air is worse! Korea's air is fine!!" 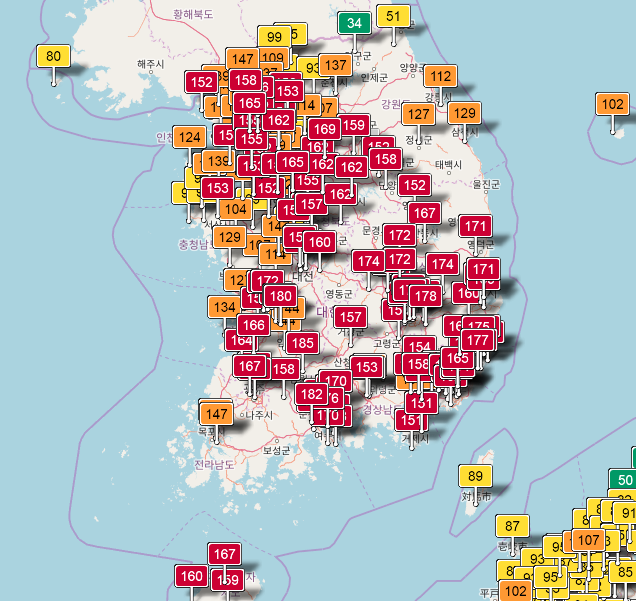 The air in Korea, especially Seoul, is not good and it is getting worse year on year. Using China or India as measuring sticks is stupid. Of course they have worse air pollution. They are the two largest populations on earth, in China's case with the largest manufacturing base in the world. Great. We all know that. That doens't make Korea's air any better. Sitting most of the year in yellow and orange and then an increasing number of red or worse days, is not good. The above map is becoming increasingly common. 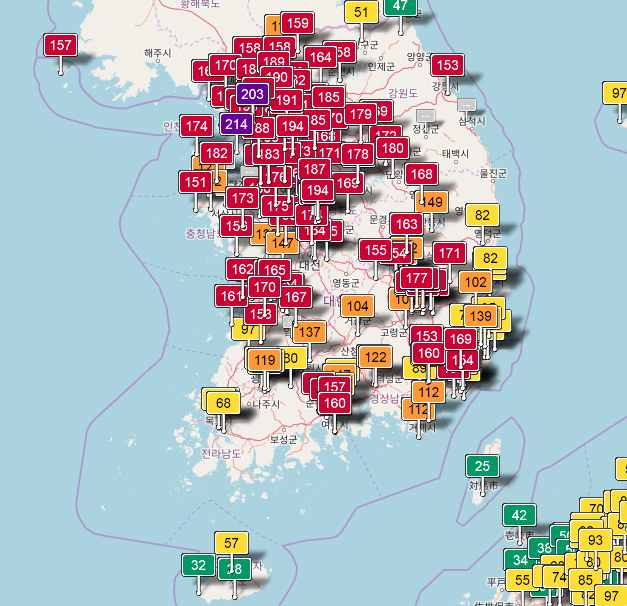 There are quantifiable statistics that show sickness and deaths in Korea from the worsening air quality. It's a fact. Are the numbers higher in China and India? Probably. But it's not germane to this conversation. You sound like the idiots defending Korea's horrendous driving, by saying "Well it's much worse in Peru or Cambodia." Alternate day driving may have to be considered. There aren't many good options. 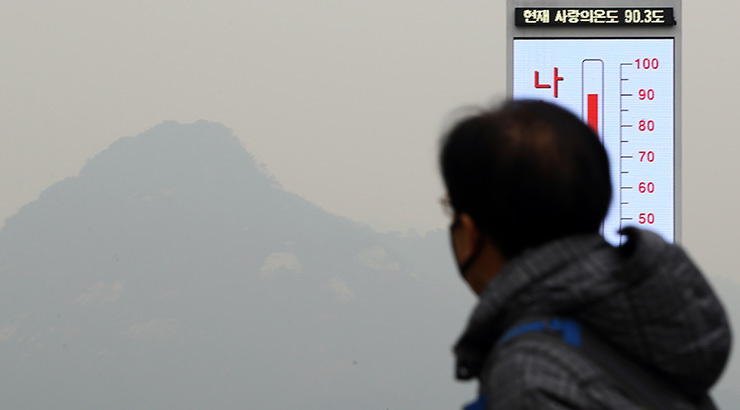 Korea's small size and dense population makes nuclear power a tricky proposition. Other options could be rather expensive. Maybe it's time to build those giant dirigible fans. "Your lung cancer will be more treatable than someone's in China." You're right, you don't see giant squares floating in the air. Weird, when was this? I'm apparently in the red but the air seems fine to me. It always seems fine here in the south except in the Spring when pollen is swirling. Yesterday. It was rainy and super grim all day here in Daegu and the red readings everywhere are not surprising. It was ok, like 80-ish. Usually Daegu is like 50 to 120. It's supposed to be bad tomorrow too. Thursday 1/18/2018 at 5pm, clearly Korea has gotten even more delicious and sparkling as the day has gone on.